← It’s time to cook and freeze! In a large bowl combine the mince, onions, garlic, breadcrumbs and herbs/spices. With your hands get in and give the mixture a good mix so that all the ingredients are combined. Place 1 sheet of puff pastry on a work surface and cut in half length ways. Take ¼ of the meat mixture and shape into a log to fit the length of the pastry. 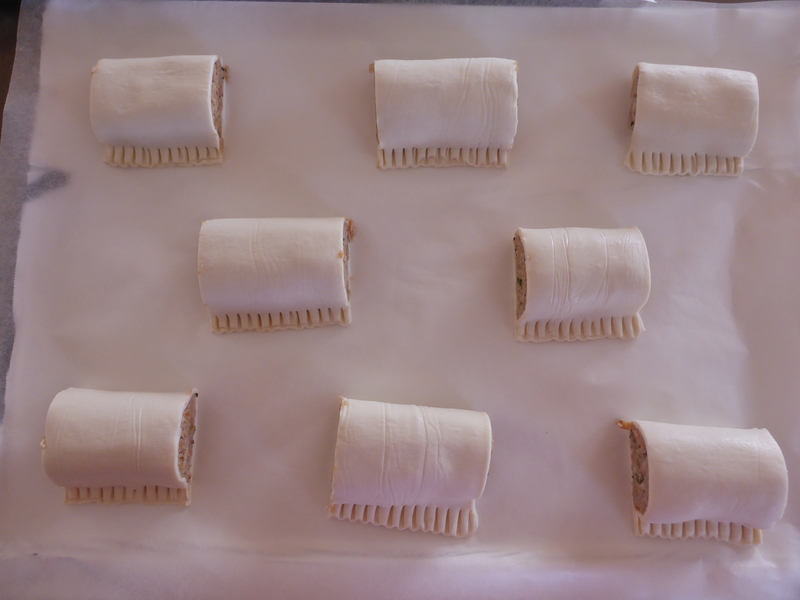 Place the meat log in the centre of the pastry and fold over so the edges meet. Press the pastry edges together and using hands press out any air pockets (which will help you to form a nicely shaped roll. Press the edges with a fork then cut the roll into four even pieces. Place on baking trays which have been lined with foil and baking paper. Repeat with remaining pastry and meat mixture. Once the sausage rolls are placed on the baking trays (I use two trays with eight sausage rolls on each tray) whisk the beaten egg with the milk until combined. Using a pastry brush, brush the pastry all over (but not underneath) and bake for 20 minutes until golden brown. If the meat looks a bit fatty add a bit more breadcrumb to the mixture. I use whatever fresh herbs I have in the garden or fridge but find that Sage, Thyme, Parsley, Chives and Oregano make a good mix. You can also use dried herbs but use sparingly as they tend to have a stronger flavour. For the last five minutes of cooking I often turn the rolls over to make sure the bottom cooks and gets that golden crispiness like the top. Always keep an eye on your sausage rolls as they are cooking so they don’t burn and if the pastry cooks too quickly on the outside turn the oven down slightly until the meat is cooked through. Let me know how they go and if you try something that works or makes the recipe better I would love to hear from you. 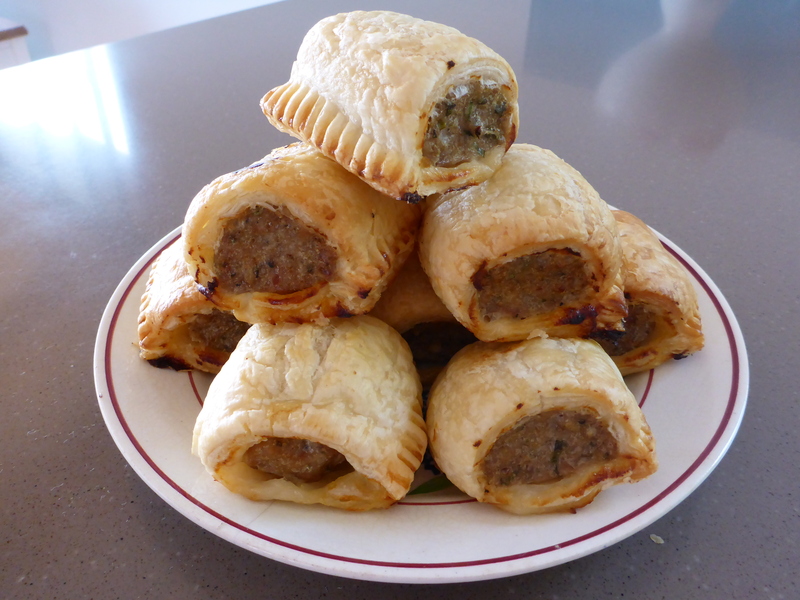 This entry was posted in Home, Recipes, Savoury (Main Meals) and tagged Pork Mince, Puff Pastry, Sausage Rolls. Bookmark the permalink.